If you are an innovator or work around innovators, you’re in good company. How do you improve your chance of success – for yourself and your team? 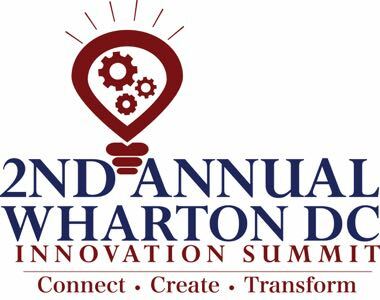 Our 2015 Wharton DC Innovation Summit directly answers that challenge. Meet top innovation thought leaders from industry and government, including fellow entrepreneurs, funders, mentors, and outstanding Wharton. Penn and other professors – ready to engage you and raise your odds of hitting your target, or finally testing that new product idea. In new workshops, startup veterans will guide you thru market-tested planning and execution steps, boosting your “success quotient” as you push your idea ahead. 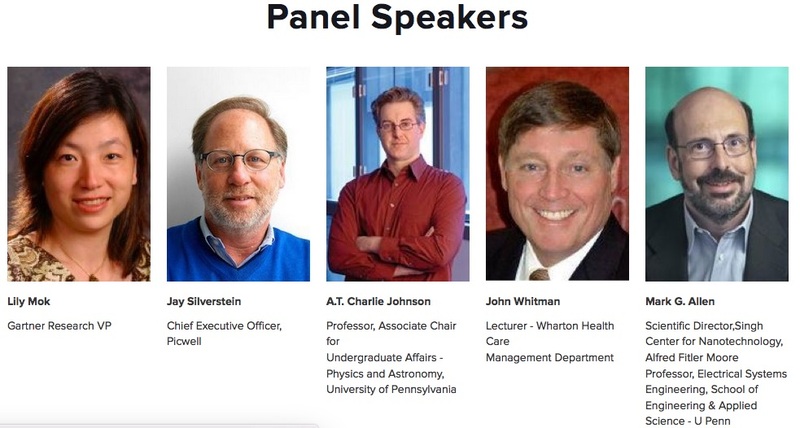 To learn more about the schedule and speakers, check our Summit website, WhartonDCInnovation.com. Ever been stretched too thin at a great conference, especially with several tracks and many potential contacts? Maximize the benefit you get, and bring a valued member of your team with you. And many more results-oriented inspirational & innovative thought - and ACTION - leaders. How much connecting can you do? And we're expecting even more this year! Connect with others - TO HELP SOLVE YOUR BIGGEST CHALLENGES, and find the tricky pathways to funding sources, strategic partnerships, vital new contacts and even long-term contracts. Create using agile ideas and new ways to identify talent, build teams, and move ideas through the marketplace – with guides for testing and refining all this. Transform your group, your company, even your industry, as you tap colleagues in major innovation hubs and clusters. If you really want to make an impact, take this opportunity to grow your idea, refine it and build a promising business. The 2015 Summit builds on the success-filled blueprint of its predecessor. Then, as now, we’ll connect innovators in many industries to new colleagues, plus many US and global resources. Our 2014 edition saw 400 attendees, 132 speakers, 45 sessions and two networking-rich receptions. 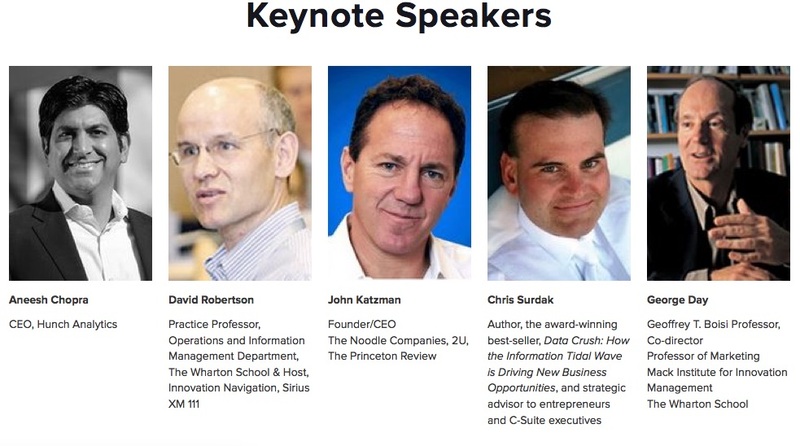 "The 2014 Wharton DC Innovation Summit was the best conference I've attended in 30 years. Most conferences we attend have only marginal interest, maybe one speaker or a specific track – the Wharton DC Innovation Summit had compelling content in every track. From the master class on building and leading a creative organization, to angel investor groups, to keynote speakers, to specific company briefings, all were well prepared and interesting! And connections to others dedicated to others dedicated to more creative and effective innovation and entrepreneurship were superb." "Congratulations on organizing such a successful event! The innovation conference was outstanding. A colleague who attended was thrilled with the whole Summit and made valuable contacts." In 2015, you’ll also meet Fortune 500 leaders and Global 2000 innovators, but also a great many more colleagues -- in startups, mid-size firms, innovative non-profits and key corporations. In short, you’ll get bigger opportunities to grow your network and sharpen your business acumen. By popular demand, we’ve planned for 20% more attendees. You’ll meet more thought leaders, have more networking interactions in workshops and guided events, and new options during structured and informal breaks. Better bring ALL your business cards. Rest assured: We’ll also build on Wharton DC’s 2014 multi-disciplinary core. It’s a design for inspiration and new learning. You’ll hear about innovation success in small and giant organizations. You’ll learn from thought leaders in biopharma, cyber and data analytics and education. In Wharton style, our food for thought also features finance, talent management and leadership -- all crucial at every step of the innovation journey. SO YOU SHOULD JOIN US IF YOU ARE …. Private funding sources – ranging from angel, venture, and private equity, to crowdfunding and other investment options. Public resources: News on innovation grants, loans, contracts and more. Get inspired by our many successful serial entrepreneurs and fledgling disruptors. Join many new innovators from startups to Fortune 500 firms, government, and academia. Join all of us in our common journey to connect, create and transform our industries and communities. while space is available and prices are low, before they rise. Consider joining the Wharton Club or a Strategic Partner to get the lower rates. Also, bonus session on Monday night only for earliest signups, and to increase your connections and improve your results! WHEN: Tuesday, April 28, and Wednesday, April 29, 2015, 8:00 am-6:00 pm, followed by Reception each evening, from 6:00 to 8:30 pm. WHERE: FHI 360 Conference Center, 1825 Connecticut Avenue, NW, 8th Floor (Universal Building South), one block south of Washington Hilton. Off-site reception on at Embassy of Indonesia on Tuesday evening (click here for more information; this is included automatically for Summit registrants who register no later than April 12). NOTE: Must be registered for Summit ASAP to be assured of admission to Embassy reception. Only 17 places left. Reception at FHI 360 on Wednesday, 4/29. METRO: Dupont Circle / Red Line / just 4 blocks away. PARKING: Several garages in and near FHI 360, including those in Universal Bldg. South and North. with more to come! (if you belong to one of these groups, be sure to type in the initials of the Partner you're a member of (under Special Instructions) when you register. Media Partners already include SiriusXM 111 ("Business Radio powered by the Wharton School), Blacktie-DC.com and ExpertClick.com, with extensive media coverage expected. ### Please list the name of your agency, nonprofit academic organization (under Special Instructions) when you register. If you would like to learn about sponsorship opportunities to increase your organization's exposure, click here to send an email to Alan Schlaifer, Wharton Club President and Summit Chair.